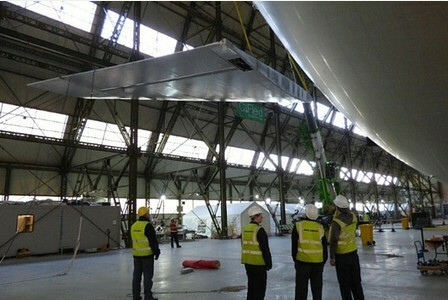 There are two airships that expect to make their maiden flights in March. 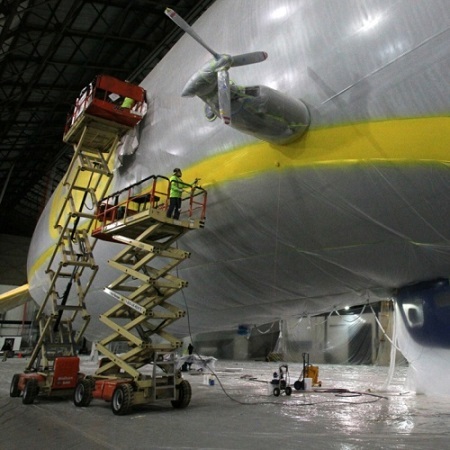 One of them is the second Goodyear Blimp NT being built at the Wingfoot Lake Hangar in Northeast Ohio, the other is the Airlander being built by Hybrid Air Vehicles at the Cardington Hangar in Bedfordshire (UK). 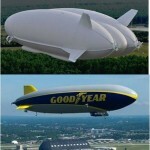 Goodyear’s second NT, or New Technology, airship has that new car – make that new blimp – smell. 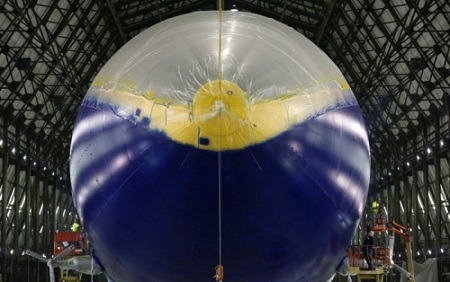 Jim Westfall, an employee with Thomarios in Copley, applies yellow paint to a detail line on Goodyear’s new airship inside the Wingfoot Lake hangar in Suffield Twp., Ohio. 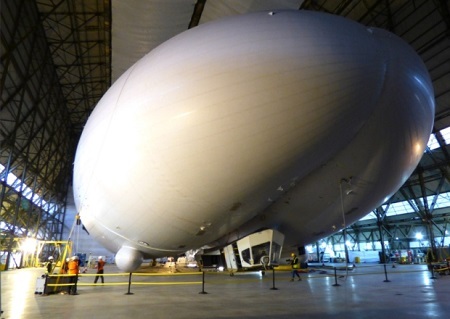 But first flight is still maybe a month away — for one thing, the semi-rigid airship is inflated with air, not helium, and remains suspended from the ceiling inside the Portage County hangar. 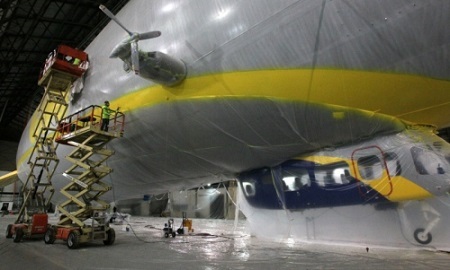 Jim Westfall, an employee with Thomarios in Copley, applies yellow paint to a detail line on Goodyear’s new airship. Photo: Ed Suba Jr. – Akron Beacon Journal. 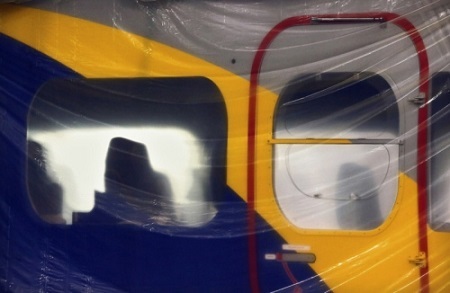 Gary Hagan (left) and Josh Scharfenberg, employees with Thomarios in Copley, apply yellow paint to lettering and lines on Goodyear’s new airship. Photo: Ed Suba Jr. – Akron Beacon Journal. Hagen’s job in part was to keep an eye on the lengthy paint hoses that ran from paint containers on the hangar floor to painters spraying the blimp from lifts. He has worked since 1974 for Thomarios, which has a specialty division that restores historical aircraft and spacecraft — projects included a Saturn V rocket. “I doodled jets, rockets I ended up painting as an adult. So it’s pretty comical,” Hagen said. 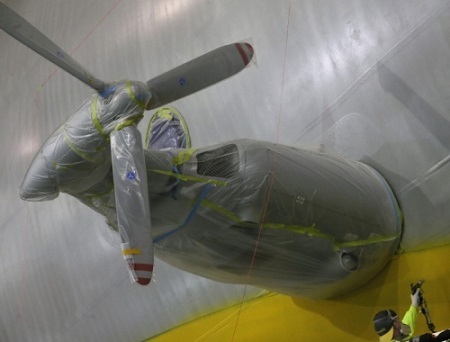 The airship’s new-car smell comes from about 120 gallons of an Akron-made specialty primer and topcoat paint. The high-tech paint comes from what is believed to be Akron’s second-oldest company, APV Engineered Coatings Inc., whose history dates to 1878. The special thermoplastic resin technology in APV’s “NeverFade” paint took about 10 years to develop, said Erin Brown-Neff, marketing director. APV designed the water-based, environmentally friendly paint to last and not fade for 15 years in hard-to-do architectural and commercial building applications, she said. “[NeverFade] is a higher performing product than anything you would see in a hardware store,” Brown-Neff said. Gary Hagan, an employee with Thomarios in Copley, applies a stencil of a “D” before beginning to paint it on Goodyear’s new airship. Goodyear required a paint that would stand up to weather, minor impacts and abrasions while not fading or cracking on an airship’s thin, flexible skin, she said. APV’s NeverFade met those standards, Brown-Neff said. 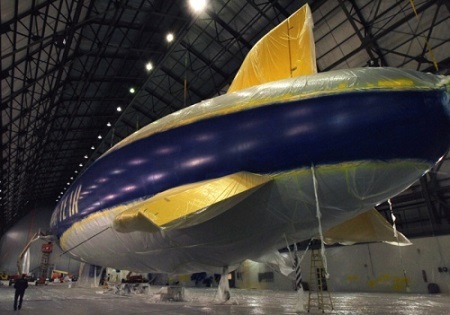 Employees with Thomarios in Copley, apply another coat of blimp blue V2 on Goodyear’s new airship. 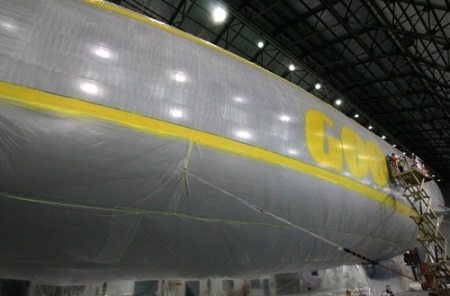 The gondola of Goodyear’s new airship is protected by plastic as employees with Thomarios in Copley, apply another coat of blimp blue V2. “At this time, it’s hanging from the ceiling because it is not lighter than air,” he said. “First flight will be in March. We don’t have a specific date for that yet,” Ogden said. 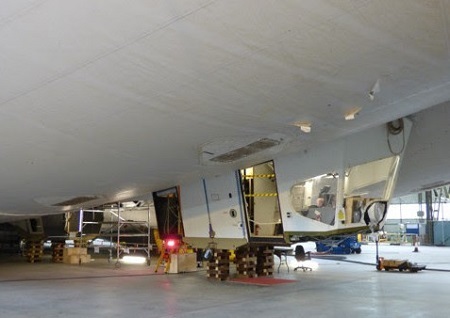 The iconic airship that currently resides in Cardington Sheds is prepared for the last major attachments which will be completed in quick succession over the coming weeks. 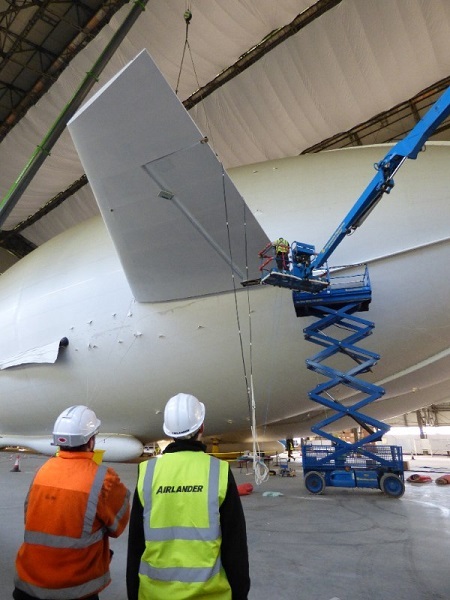 The Airlander 10, which is the largest aircraft in the world, saw the attachment of its first fin today, with the remaining fins and engines to come shortly ahead of its first UK flight in spring. The giant fin was expertly lifted and attached to the unique hull in a matter of hours, using a giant crane usually used in rail engineering. The fin, measuring 9 x 11 m, was secured to the hull using a series of cables and clamps that will maintain its position, even under duress. 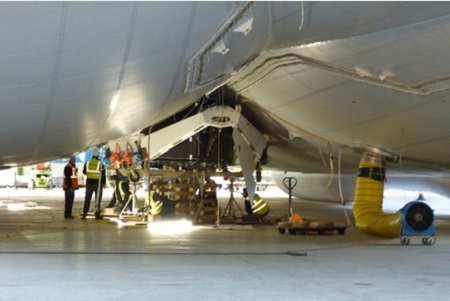 Earlier the control car of the Airlander had been attaqched to the hull of the airship. 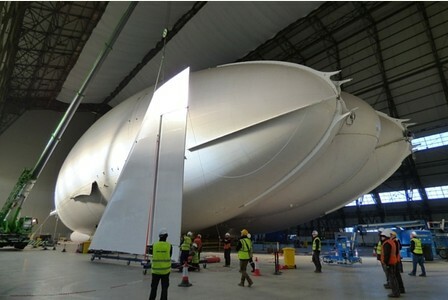 Airlander re-build is nearing completion. Here the control car is fitted to the hull. Photo courtesy of Bedford Today – Bedford Times & Citizen. The mission module, which includes the cockpit and payload bay, follows the attachment of the fuel tank and the payload beam, which supports bulky external cargo. Fuel tanks, payload beam, control car. The fuel tank had also been installed. 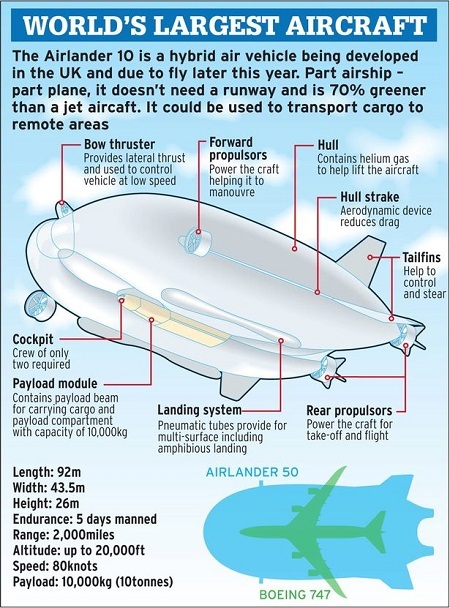 This entry was posted in Airships, Blimps, Hybrid Airships, Semi-Rigid and tagged Airlander, airship, blimp, Blimp NT, Cardington Hangars, goodyear, Hybrid Air Vehicles Ltd., hybrid airship, Maiden flight, Wingfoot Lake. Bookmark the permalink.